+ Bug fixes and improvements. Trigon is a very fun and exciting classic block match puzzle game.Trigon gameplay is simple - on a hexagon board, drop triangle blocks of different shapes in order to create and destroy full lines on the screen both vertically and horizontally. Clear multiple lines at a time to get diamonds. Combine... see more Trigon is a very fun and exciting classic block match puzzle game. 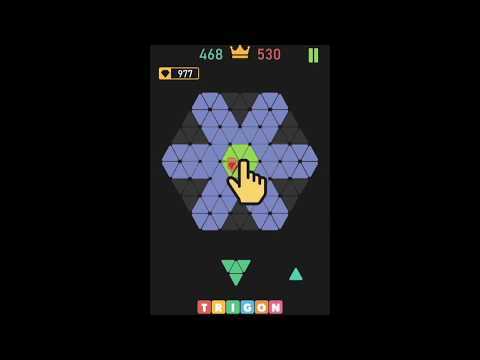 Trigon gameplay is simple - on a hexagon board, drop triangle blocks of different shapes in order to create and destroy full lines on the screen both vertically and horizontally. Clear multiple lines at a time to get diamonds. Combine ,connect and destroy puzzle block shapes! You can challenge yourself by competing with your friends, getting high score and sharing it with the world.Combine, connect and match blocks in this addicting challenge that will put your logic skills to the test. This KING of BRAIN TEASERS will train your brain, help you develop logic and mental capacity. Don&apos;t let the shapes fill the hexa grid! Check out special themes to make your game experience endlessly exciting! A great casual puzzle game that you can not stop playing once you started the game. Enjoy this free block puzzle mania with no time limits. Merge, match, stack triangle block in a column or row in a hexagon grid. Try your best to earn as many diamonds as possible to unlock new beautiful themes. You can never stop loving this puzzle game! Always save the game when you quit or turn off your phone. Optimized engine for energy saving. Play without wasting energy. Enjoy the game anywhere and anytime. - Fun sounds and gorgeous visual effects.